Pictures from inside Ariel Castro’s house were shown today in court as the Cleveland abductor is to be sentenced. The detective in charge of the case described how Ariel Castro abducted the three women, took them to his home and immediately tied them in chains in the basement and raped them. He put a motorbike helmet on each girl and left them in the dark basement overnight, Detective Andrew Harasimchuk said. Dr. Frank Ochberg described to the court the long-term impact the continuous abuse will have on the victims. He described their “terror-induced states of mind, defilement, dehumanization and how they were treated like animals and deprived of their sense of self and dignity”. “They have life sentences. They will never be free of the damage done,” Dr. Frank Ochberg told the court. FBI agent Andrew Burke said he had been familiar with Gina DeJesus’ and Amanda Berry’s disappearances prior to their discovery earlier this year. He described the moment he saw the girls as “surreal” as they were so pale and malnourished. Andrew Burke talked the court through pictures of inside the home, describing how the back door was equipped with an alarm, a bedspread separated the kitchen and living area, a porch swing obstructed a flight of stairs and a curtain was put over the stairs leading to the area where the women were held captive. Bedroom windows were boarded shut from the inside with heavy closet doors and doorknobs had been removed and replaced with multiple locks, he said. The house was divided in ways to make it more secure and to hide the existence of rooms, he said. 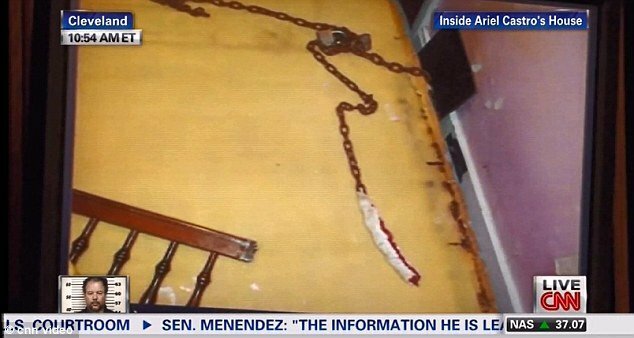 Pictures of dirty mattresses draped in chains were shown as Burke explained it was from the room Gina DeJesus and Michelle Knight lived. Authorities also found a “significant amount” of cash in a washing machine in the basement, the same room as the pole the women were chained to while he raped them. On occasion, Ariel Castro would throw the money at the women after abusing them and require they pay him to pick up any special items for them when he left the house, the agent said. He would also force them to hold a gun to his head and dare them to shoot him. The letter written by Ariel Castro was found in his home and shown in court. It read “Confession and Details” at the top. Early in the hearing, Ariel Castro tried to apologize to the victims, but after speaking with the judge said he would do that later in the proceeding. A picture of a handwritten letter was also shown, in which Ariel Castro described the horrible things he forced the women to endure when they were in captivity. The accused arrived in court just after 9 a.m. shackled in his orange prison jumpsuit to learn his fate and come face-to-face with one of his victims for the first time since they were rescued. Michelle Knight, who suffered for the longest and most severely, is expected to come face-to-face with Ariel Castro for the first time since she was rescued to speak about the horrific abuse. Officer Barbara Johnson was the first to take the stand today. As one of the first responders to the “house of horrors” on Seymour Avenue, Cleveland, she described the girls as very pale, very thin and very scared when they found them. Dr. Gerald Maloney, the emergency room doctor on duty when the three victims were taken to the hospital, described them as “very much emotionally fragile at the time” and said Michelle Knight requested that no male physicians attend to her. He said Michelle Knight specifically was bruised and emaciated. Every witness described the girl’s as malnourished, pale and traumatized. With the possibility of the death penalty for a forced miscarriage taken off the table, Ariel Castro stands to get life in prison plus 1,000 years today.